Suitable for vegetarians. A rich chocolate sponge, layered with chocolate flavour creme and chocolate flavoured syrup then smothered in Cadbury Milk Chocolate, topped with chocolate curls and decorated with twelve Cadbury Flake pieces. 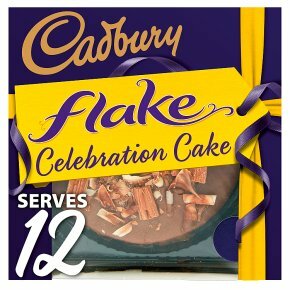 Enjoy the company of friends and family with a delicious slice of Cadbury Flake Celebration Cake.